Sept. 9, 2010: In a paper published today in the Astrophysical Journal Letters, a group of professional and amateur astronomers announced that Jupiter is getting hit surprisingly often by small asteroids, lighting up the giant planet's atmosphere with frequent fireballs. of the June 3rd impact recorded by Christopher Go of Cebu City, the Philippines. "Jupiter is a big gravitational vacuum cleaner," says co-author and JPL astronomer Glenn Orton. "It is clear now that relatively small objects left over from the formation of the solar system 4.5 billion years ago still hit Jupiter frequently." The impacts are bright enough to see through backyard telescopes on Earth. Indeed, amateur astronomers were the first to detect them, recording two fireballs in 2010 alone—one on June 3rd and another on August 20th. Professional astronomers at NASA and elsewhere have followed up on the amateur observations, hoping to learn more about the impacting bodies. According to today's Letter, first-authored by Ricardo Hueso of the Universidad del País Vasco in Spain, the June 3rd fireball was caused by an object some 10 meters in diameter. 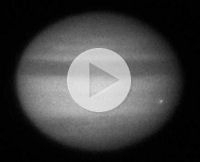 When it hit Jupiter, the impact released about 1015 Joules of energy. For comparison, that's five to ten times less energy than the Tunguska event of 1908, when a meteoroid exploded in Earth's atmosphere and leveled millions of trees in a remote area of Russia. Scientists continue to analyze the Aug. 20th fireball, but think it was comparable in scale to the June 3rd event. Before amateurs spotted these fireballs, scientists were unaware collisions so small could be observed. The first hint of their easy visibility came in July 2009 when Anthony Wesley, an amateur astronomer from Australia, discovered a dark spot on Jupiter. It was clearly the swirling debris of an impact event that he had only just missed. Next time, however, his luck would improve. On June 3, 2010, he caught a fireball in action. 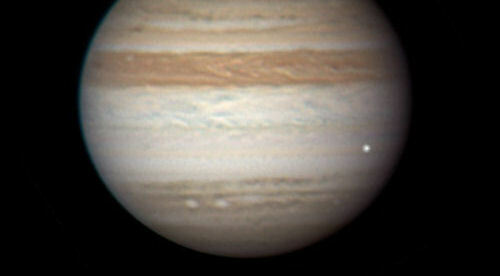 A color composite image of the June 3rd Jupiter impact flash. Credit: Anthony Wesley observing from Broken Hill, Australia. "I was watching real-time video from my telescope when I saw a 2.5-second-long flash of light near the edge of Jupiter's disk," says Wesley. "It was clear to me straight away it had to be an event on Jupiter." Another amateur astronomer, Christopher Go of the Philippines, confirmed that the flash also appeared in his recordings. Professional astronomers, alerted by email, looked for signs of the impact in images from larger telescopes, including NASA's Hubble Space Telescope, the European Southern Observatory's Very Large Telescope in Chile, and Gemini Observatory telescopes in Hawaii and Chile. Scientists saw no thermal disruptions or typical chemical signatures of debris, which allowed them to put a limit on the size of the object. The Aug. 20th fireball recorded by Aoki Kazuo of Tokyo, Japan. The second fireball on Aug. 20th was first detected by Japanese amateur astronomer Masayuki Tachikawa of Kumamoto city and quickly confirmed by another Japanese amateur, Aoki Kazuo of Tokyo. This one flashed for about 1.5 seconds and, like the June 3rd fireball, left no debris observable by large telescopes. "It is interesting to note that while Earth gets smacked by a 10-meter-sized object about every 10 years on average, it looks as though Jupiter gets hit with the same-sized object [as much as] a few times each month," comments Don Yeomans, manager of the Near-Earth Object Program Office at JPL, who was not directly involved in the study. Learning how often Jupiter is hit can tell astronomers something about the meteoroid population throughout the solar system—a matter of considerable interest right here on Earth. Just yesterday on Sept. 8th, a 10-meter class asteroid named 2010 RF12 flew past our planet without hitting. A somewhat smaller space rock, 2008 TC3, actually burned up in the atmosphere above Sudan two years ago. "The Jupiter impact rate is still being refined," adds Yeomans, "and studies like this one help to do just that."